After researching my bee problem and sending photos of the poor beasts to my instructor, the answer seemed the bees were dying at relatively normal rates but were probably hungry as they were starting up for the spring. I can’t feed sugar-water with the temps below freezing so the answer is fondant. I bought a chunk, seven pounds to be exact, from a local candy maker and found this really helpful YouTube Video on how to feed it. Finding a time to open the hive when I wouldn’t kill them all off from the chill was key. Sunday afternoon, it reached the mid-thirties and the wind died a bit. I chopped off a pound or so of the gooey substance, fired up my smoker and headed out to feed. Normally, I wouldn’t have so much fuzzy dark hair and clothing when opening the hive. My goal was to get in and out as quickly as possible so I never even considered the bees might attack. When I popped open the top and lifted the homosote insulating boards, I was surprised to see how many bees were congregating on the top of the frames. This hive body is full of only honey frames, I left to help them through the winter. I had used a queen excluder screen to keep my queen from going up to this layer, insuring there was only sweet food for the season. They were slow-moving and irritable, their buzz sounded sharp. I gently laid the fondant chunk on top of the frames then fitted a wooden box that holds the sugar-water feeder on top. This gives them room to come up and devour the fondant. I quickly closed up the top and crossed my fingers the ladies will be happy and healthy until it is warm enough to check again. This entry was posted in beekeeping. 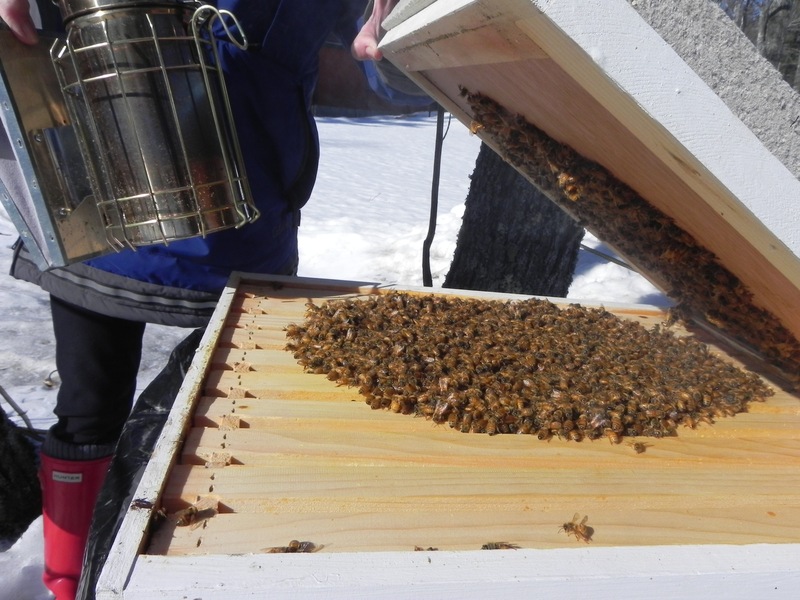 Tagged beekeeping, fondant, New Hampshire, winter bee feeding, winter hives. Next Post Next post: Rye on the Rocks with a Twist! How lovely to keep bees. It must be great to have your own honey. I hope they will be ok. Yesterday on my walk I saw a huge colony of ground bees, never even knew there was such a thing until then. I haven’t taken any honey yet as this was my first year, but you better believe if there is any left this spring I will be helping myself to a little! Glad to hear the winter wasn’t too bad for them and the hive is healthy! Hopefully spring is just around the corner. How odd that such a mass of them had congregated there and in that form! Still, as long as they are healthy. Probably a bit too early to worry about anything yet. I had what seemed like a lot of dead ones all winter. I can’t imagine why they were all on top of the honey frames but hope the next time I can peek they will be fat, happy and the queen will be there. The cold has been unbelievable this year. Warmer here, but haven’t seen any bees yet…worry about that. Stay warm and hang on little buzzy guys! Stay warm indeed! Their diet of fondant is an expensive luxury. I hope they make it. All the stories about dying bees are disturbing because without them we’re in trouble.